The first awards ceremony was held on April 6, 1947, at the Waldorf Astoria hotel in New York City. The first prizes were "a scroll, cigarette lighter and articles of jewelry such as 14-carat gold compacts and bracelets for the women, and money clips for the men". 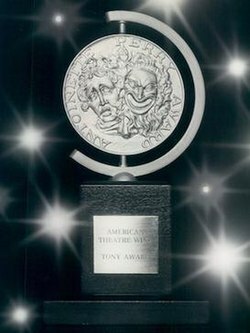 It was not until the third awards ceremony in 1949 that the first Tony medallion was given to award winners. ^ a b Staff (undated). "Rules & Voting". tonyawards.com. Retrieved September 13, 2013.